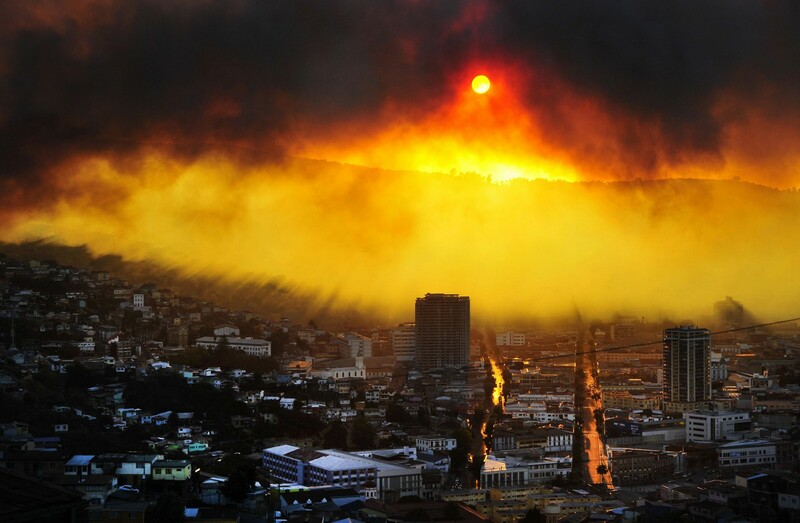 Firefighters try to extinguish a fire, in Valparaiso, Chile, on April 13, 2014. 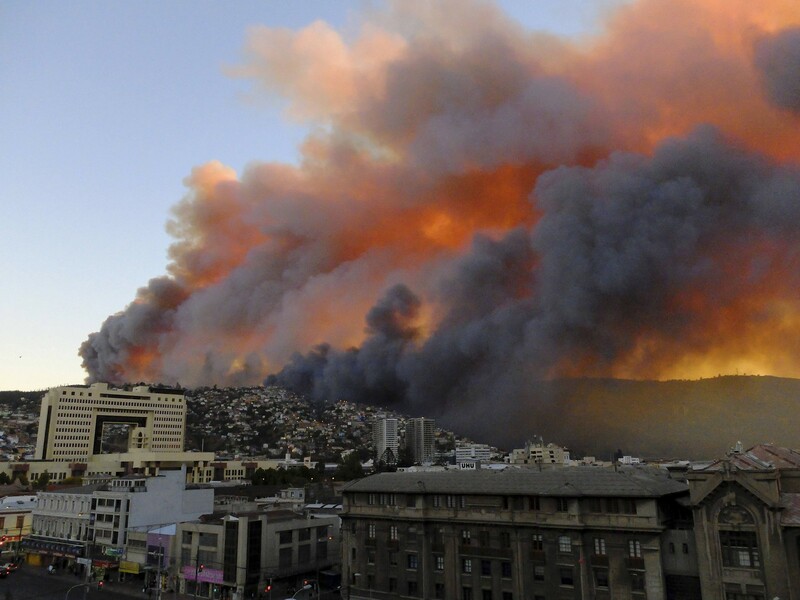 More than 10,000 people were evacuated as an army of firefighters battled a killer blaze that --on the eve-- tore through parts of Chile's historic port of Valparaiso and left at least 11 people dead. 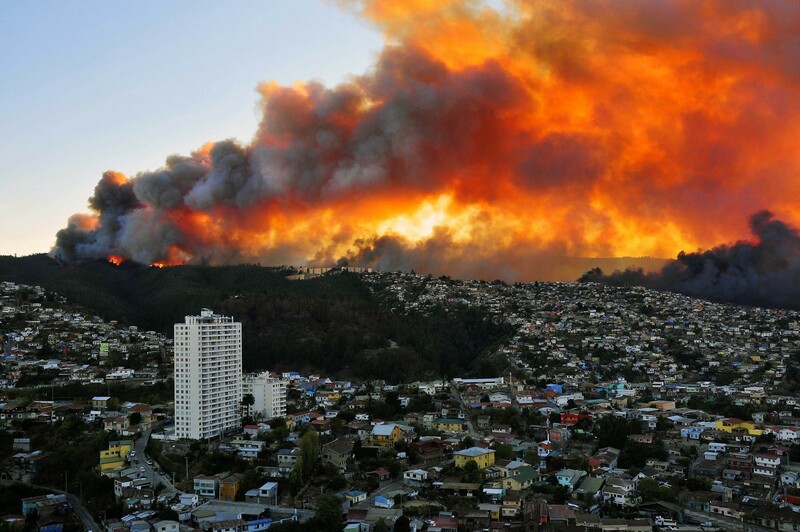 VALPARAISO, Chile - Emergency responders struggled Monday with outbreaks from a deadly blaze that tore through parts of an historic Chilean port city, as authorities hoped to have control of the flames in two to three days. 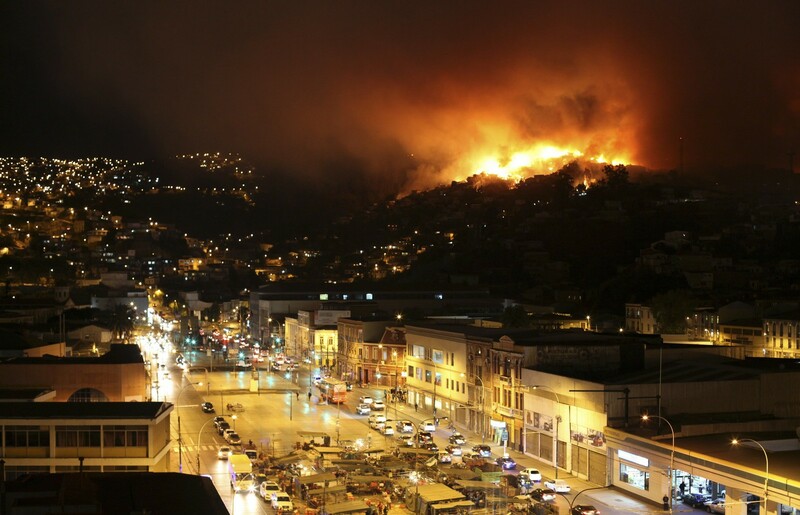 The Valparaiso fire, still burning amid strong winds, has killed 12 people and is being battled with the help of 11 helicopters, six planes and 2,000 police and military troops. Authorities say they aim to have control of the fire in the next 48 to 72 hours and then begin damage assessment and reconstruction. 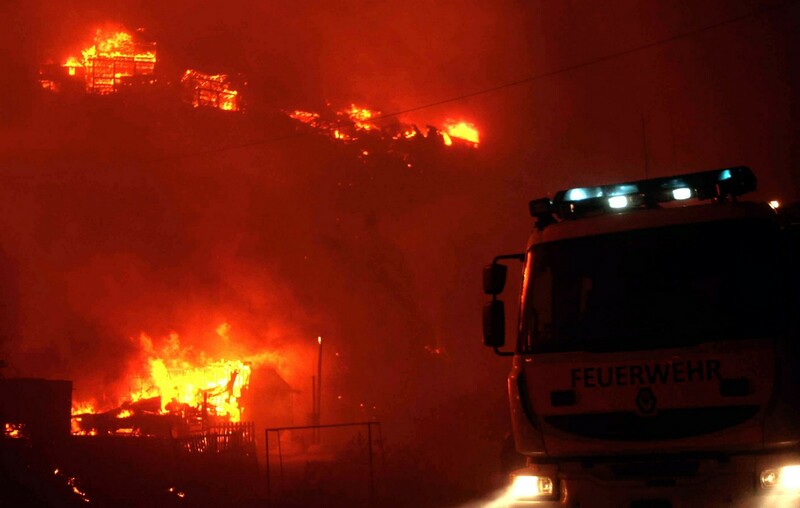 The blaze, which started in woodland Saturday, destroyed 2,000 homes as flames advanced on the city of 270,000, famed for its UNESCO-listed center with cobblestone streets and brightly painted wooden homes. 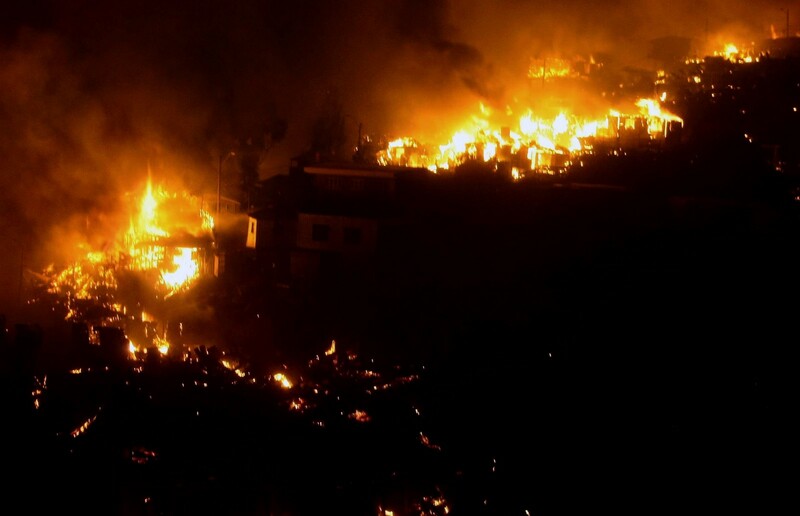 It also affected 8,000 properties, razed 850 hectares (2,100 acres) and forced 10,000 people to evacuate, according to latest figures. 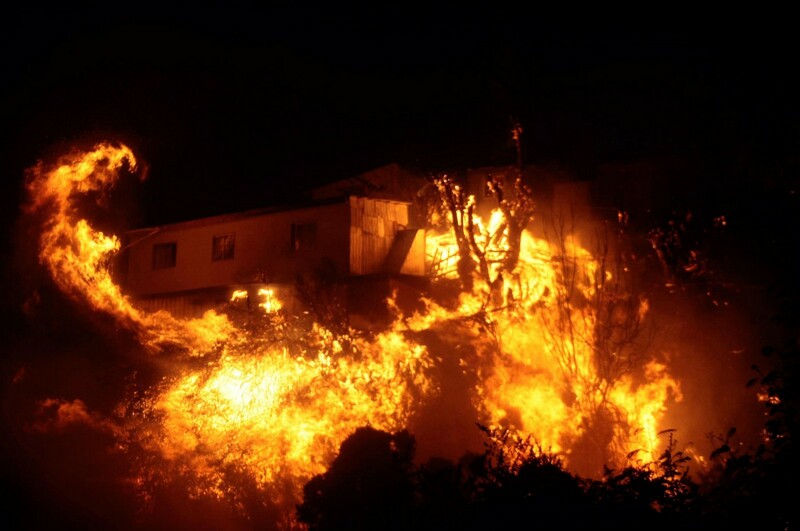 The hillside neighborhoods of Jimenez, Mariposas, Santa Elena Rocuant and especially Ramaditas, where there is ample vegetation and buildings are made of light, flammable material, were hard hit by wind-whipped flames. The fire affected poorer neighborhoods in particular, where tin and wood homes often built without permits are perched on hillside slopes. 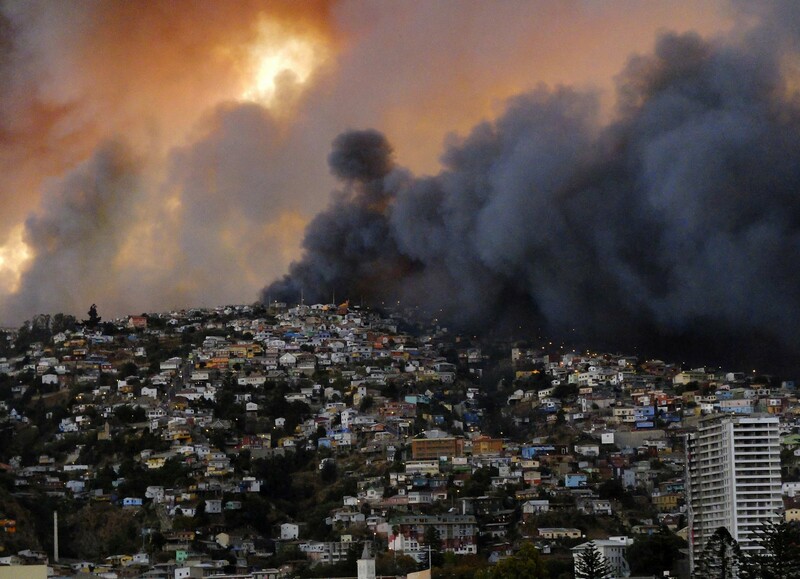 The historic port of Valparaiso, however, remained unscathed. Residents who had been evacuated returned to their neighborhoods to discover their homes reduced to smoldering ruins. Those caught in the path of the blaze after it erupted Saturday afternoon reported a fast-moving inferno that roared towards town, fanned by winds and searing temperatures. 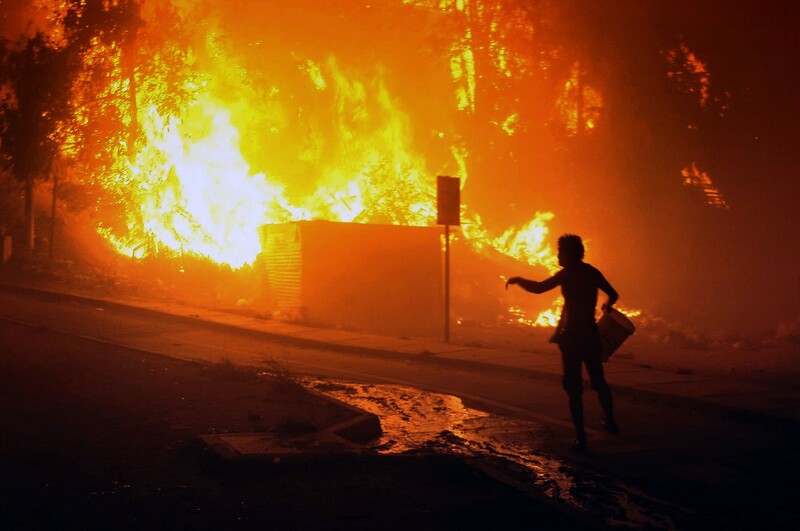 But some residents refused to leave their homes overnight for fear of losing all of their possessions to flames or looters, even as police and emergency crews guarded the streets. 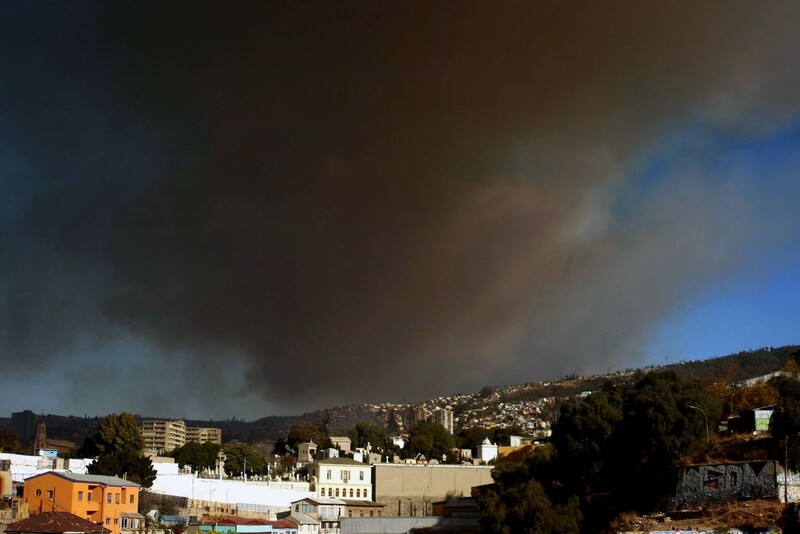 Smoke from a forest fire is seen in Valparaiso city, northwest of Santiago, April 12, 2014. 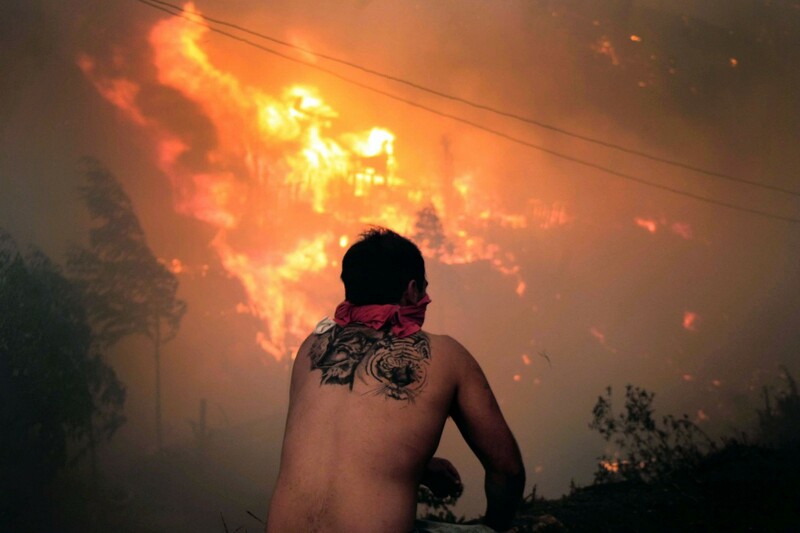 More than 100 homes were burned due to the forest fire but there have been no reports of death or injuries, local authorities said. Exports from the world's top copper producer were also unaffected. 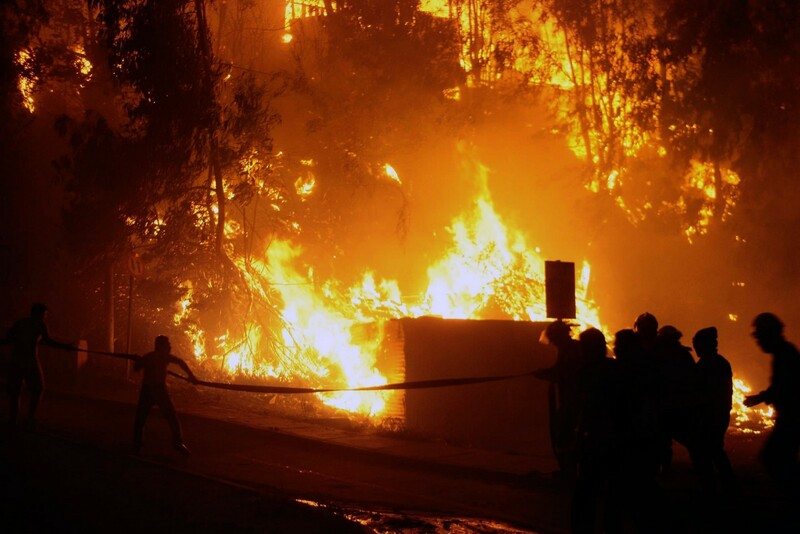 The La Cruz and Las Canas neighborhoods were among the most affected by the blaze. Ambulance crews treated residents for smoke inhalation as the fire engulfed block after block. 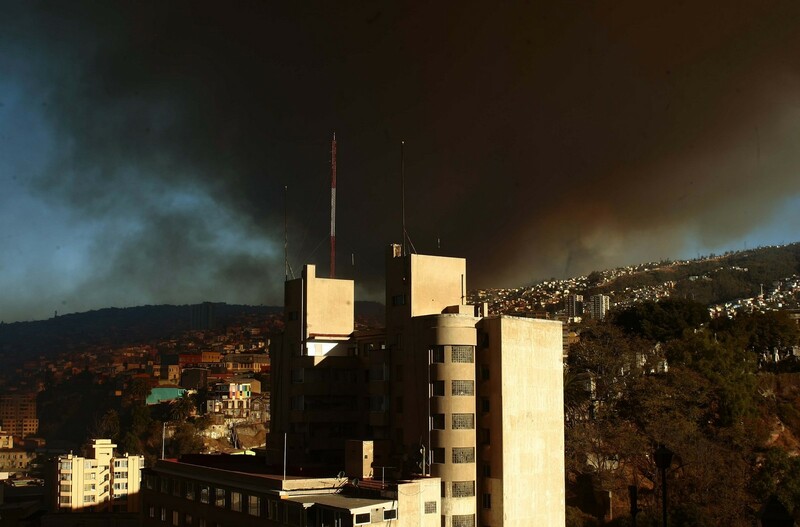 "The weather is complicating the situation," emergency official Guillermo de la Mazza told reporters. 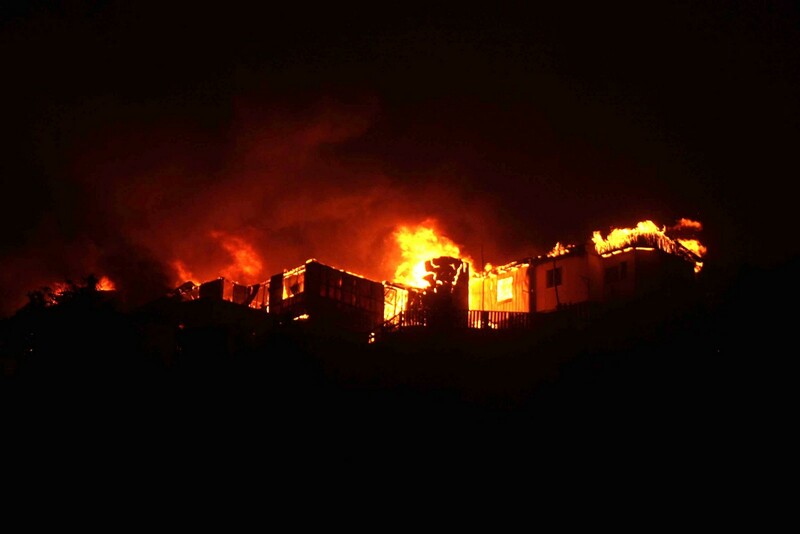 The fire was pushed by strong Pacific coast winds. "The wind is not doing us any favors. 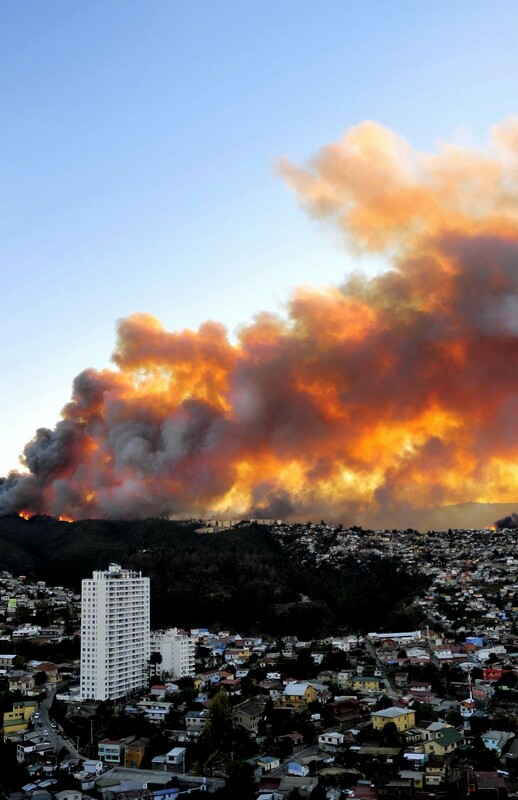 The evacuation is our top priority, along with controlling the fire itself." A cloud of smoke rises from burning houses in Valparaiso. There have been no reports of death or injuries. A local stares at houses in flames during a fire in Valparaiso. 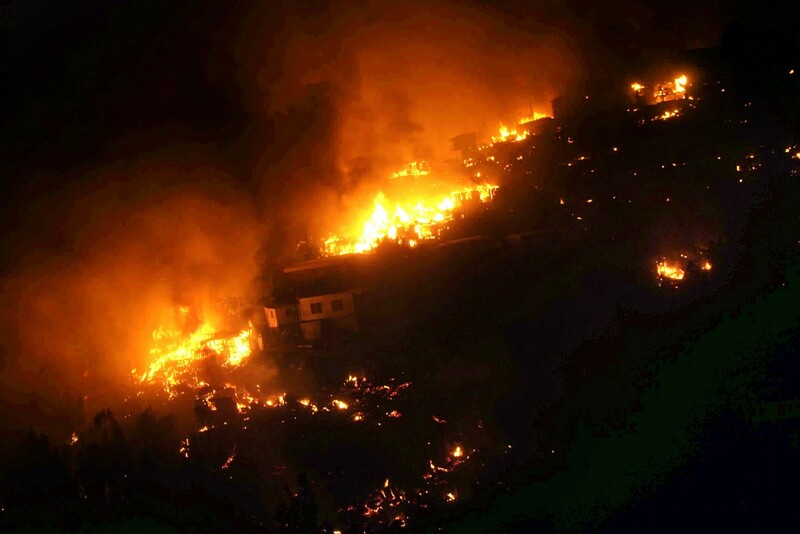 Authorities decreed a red alert for the area after the fire consumed more than 100 houses. 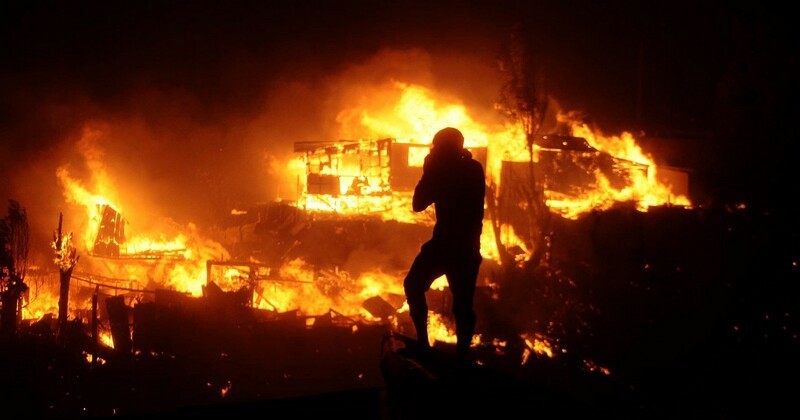 A firefighter stands next to burning houses. View of houses in flames during a fire in Valparaiso. 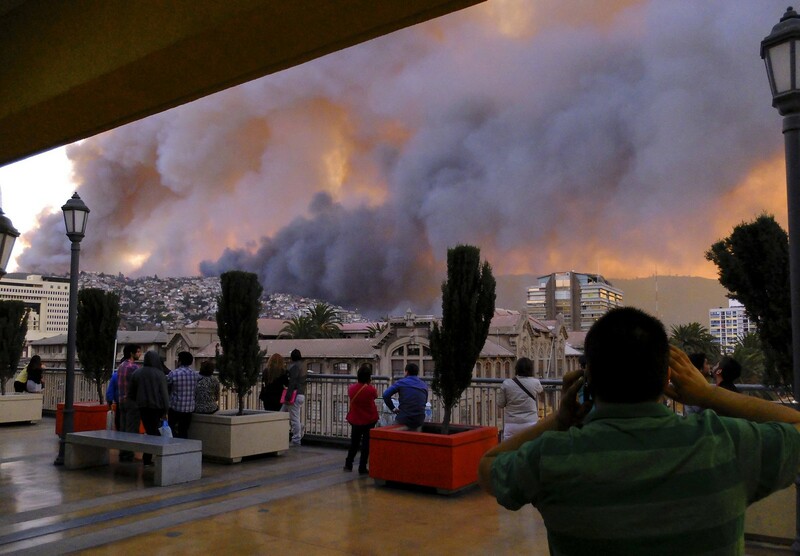 A general view shows a fire in Valparaiso, 110 km west of Santiago, Chile, on April 12, 2014. View of burning houses during a fire in Valparaiso. 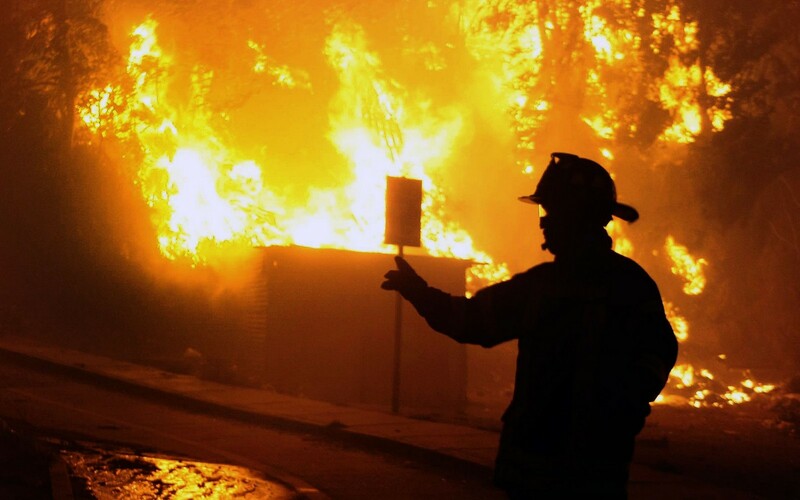 A firefighter truck stands near houses on fire.